We’d love your help. 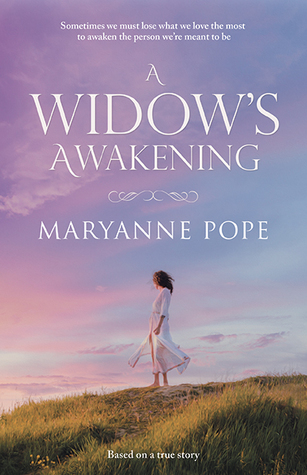 Let us know what’s wrong with this preview of A Widow's Awakening by Maryanne Pope. A WIDOW'S AWAKENING is a fictional account based on the true story of a young woman’s struggle to come to terms with the on-duty death of her police officer husband who fell to his death while investigating a breaking and entering complaint. Engaging, powerful, heart-wr Do you believe in soul mates? What if the death of your soul mate meant the birth of your life-long dream? To ask other readers questions about A Widow's Awakening, please sign up. I’m having a difficult time writing a review for this book because I’m not sure how I feel about it. The book is about Maryanne Pope who loses her police husband in an “accident” even though she doesn’t want to call it that. I understand that Pope probably helped herself by writing the book but I thought it was too long and drawn out. She does go into a lot of thoughtful things about Christianity, Greek Orthodox, or is there more than just life here on earth. I suppose if you aren’t committed to I’m having a difficult time writing a review for this book because I’m not sure how I feel about it. The book is about Maryanne Pope who loses her police husband in an “accident” even though she doesn’t want to call it that. I understand that Pope probably helped herself by writing the book but I thought it was too long and drawn out. She does go into a lot of thoughtful things about Christianity, Greek Orthodox, or is there more than just life here on earth. I suppose if you aren’t committed to a religion you might take this book as a means to start thinking about what happens after death and why were are really her. It did not of that for me. I do like the fact that she helped changed a law in her part of Canada about compensation of police widow’s. She does seem to want to do something helpful and useful with her loss. A Widow's Awakening follows the life of a woman whose husband is killed in the line of duty. As a fallen officer she receives his salary which frees her to do the writing that she would like to do. It follows her as she travels, grieves, battles constant reminders and phone calls. I would not recommend this for an ultra-sensitive reader or one who is in a grieving period. It was a bit depressing to read. Whenever I'm feeling a bit sorry for myself, a bit unhappy or grumpy, I should re-read this book, a novel based on a true story of a woman whose husband had a fatal accident when they were in their early thirties. It's not only a book about grief, it's an honest account of learning to live.